I read this article and found it very interesting, thought it might be something for you. The article is called Low Carb Savory Galette Recipe with Mushrooms, Manchego, and Thyme and is located at https://www.anediblemosaic.com/low-carb-savory-galette-recipe-with-mushrooms-manchego-and-thyme/. This Low Carb Savory Galette Recipe with Mushrooms, Manchego, and Thyme makes a beautiful autumnal appetizer or addition to brunch. So many people tell me that the thing they miss most after going keto or changing over to a low carb way of eating is BREAD! I can definitely relate. There’s something incredibly comforting about a slice of toast slathered in butter, a cream-filled donut, a wedge of chocolate cake, or a flaky-crusted chicken pot pie. But the good news is that so many of these recipes are fairly easy to remake into a low carb version that will actually nourish you and won’t lead to lethargy, bloating, and a sugar crash later! This Low Carb Savory Galette Recipe with Mushrooms, Manchego, and Thyme has a flaky, flavorful crust with a simple mushroom filling. Garlic and thyme add depth of flavor, and Manchego cheese makes it something truly special. If you’re planning a holiday party and want to serve appetizers that are just a little different, these would be perfect. Or if you’re looking for holiday brunch ideas, this savory galette recipe is lovely served with any kind of eggs you can imagine. A galette is a French term that refers to certain cakes. What we tend to think of as a galette is typically a rustic, free-form pastry with either a sweet or savory filling, with the outer rim of the pastry folded over the filling to create a sort of crust along the outside perimeter. The beauty of a galette is that each one is hand-shaped and unique. Traditionally, tarts are more elegant and refined looking, while galettes are more rustic and free-form. Tarts are baked in tart pans, which are typically fairly shallow (compared to pie pans) and can be round, square, or rectangular. The outside of a tart pan is commonly fluted so the tart has a pretty edge. Additionally, the bottom of tart pans are frequently removable so you can easily remove the tart. Another difference between a tart and a galette is that tarts have the option of a more liquid-y filling (such as some kind of quiche or custard pie). Alternatively, because the filling for a galette is placed in the center of the pastry dough that stands alone (i.e., not in a tart pan or pie plate), galette filling should not be runny. There are several distinguishing differences between a pie and tart. First, the pans used to bake them are different. A tart pan is quite a bit more shallow than a pie pan, and the sides of a pie pan are usually sloped, while the sides of a tart pan are typically straight (and sometimes fluted). Second, tarts have a bottom and side crust; however, pies can have a top crust only, bottom crust only, or top and bottom crust. Third, the shape of a pie is classically round, but tarts can be round, square, or rectangular. Can You Make a Tart in a Pie Pan? You can make a tart in a pie pan; however, it’s important to note that you will probably not have enough crust to come all the way up the sides of the pie pan. Additionally, there will not be enough filling to fill the entire pie pan. A tart recipe made in a pie pan isn’t likely to look as pretty as it would in a tart pan, although technically it should work. The delicious savory mushroom filling for these galettes (above). One of the main factors to consider in keto baking is the fact that the flours we use don’t contain gluten. (Barley, rye, and wheat products (including the commonly used all-purpose flour) all contain gluten.) In regular baked goods, gluten acts as a binder, and lends a soft crumb and tender mouthfeel. We do our best to use low carb keto-friendly ingredients to simulate the effect of gluten in keto baking. The great thing about this crust is that it’s flaky (at least as flaky as I could get without using gluten). Also, I don’t use binders such as xanthan gum and guar gum, which can cause GI distress in some people (I’m speaking from experience here, which is why I don’t use these two gums). Instead I tried to keep the ingredient list as short as possible, while utilizing foods that I actually want to put in my body! And maybe the best thing about this crust is that you can roll it out just like you would a regular pie crust! (This amount of dough can also be used to line a 9-inch pie plate if you are so inclined.) Total game changer here. I use a similar method to make a low carb roll-out crust that I use to make a regular pie crust. First I whisk the dry ingredients together; after this, I cut in cold butter and cream cheese. Then I mix in beaten egg, which acts as a binder. Next, I chill the dough while I make the savory galette filling. Finally, I roll the dough out between two sheets of parchment paper. For the pastry crust, whisk together the almond flour, coconut flour, tapioca flour, oat fiber, and salt in a large bowl. Cut in the butter and cream cheese until it looks like coarse crumbs. Whisk together the egg and vinegar, and add it to the almond flour mixture; mix with a fork until it forms a dough, lightly kneading it together with your hands a few times if necessary. Form the dough into a ball and then flatten it slightly into a disk; wrap in plastic wrap and chill (about 10 minutes in the freezer or 1 hour in the fridge). For the filling, heat a medium skillet over medium heat. Once hot, add the butter and once melted, add the mushrooms. Cook until they’re starting to brown, about 10 to 12 minutes, stirring occasionally. Add the garlic, thyme, salt, and pepper, and cook 1 minute, stirring constantly. Cool to room temperature. When the pastry dough is chilled and the filling is cooled to room temperature, preheat the oven to 350F and line a large baking sheet with parchment paper or a silpat liner. Divide the dough into 6 equal pieces; roll each piece into a ball, and then roll each ball between 2 pieces of parchment paper out to a 5 to 6-inch circle. Divide the cheese between the 5 pastry circles, and top with the mushroom mixture. Carefully fold the outer 1 inch of the dough up over the filling. Arrange the galettes on the prepared baking sheet and bake until the pastry crust is golden, about 25 minutes. Disclosure: This post contains Amazon affiliate links to products I believe in, which means that even though it doesn’t cost you anything extra, I will receive a small amount of money from the sale of these items. 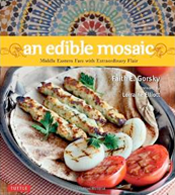 Thank you for helping to support An Edible Mosaic!